1. 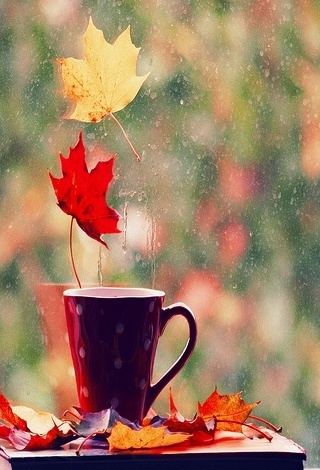 Favorite thing about it: the cool air, warm drinks, clothing, food, and watching the leaves change. 3. Favorite Scent/Candle: Anything with cinnamon/spice. 4. Best Lipstick: deep reds. 5. Go to Colors for the Eyes: anything earthy and brown. I’ve thought about wearing red, even! Or maybe a wine color. 6. Favorite outfit to Wear: jeans with my brown boots, a plain black or white shirt with a colorful warm scarf. 7. Autumn Treat (what I will treat myself to): Tastfully Simple’s Nana’s Apple Cake, brownies, cookies, and pumpkin bread. 8. Favorite Place to be: If I can’t visit a Fall Festival, then inside with a warm cup of cider. TAG! You’re all it! What are some of your favorite things about Autumn? I love that photo so much! A. Same as you, definitely.Just add the leaves and the trees to that… and bonfires. C. Baking scents. Currently burning Pumpkin Caramel Latte and Autumn Day from B&BW. E. Pretty much the same as four. G. I haven’t broken down yet, but I dreamed about them last night. Candy Corn. Also, pecan and pumpkin pie. Mmmm..
8. Bundled with a book, outside by a fire, or in a cemetery. 1. Favorite thing about it: the cool air perfect for running, seeing the reds, oranges and yellows dance on the trees, hearing the geese fly south, wearing boots and leggings and sweaters with scarves. 6. Favorite outfit to Wear: skinny jeans, brown riding boots, tank under a cardigan with a scarf. 8. Favorite Place to be: on the couch snuggling with my pup- this is an anytime thing really.